On Sunday 4th August 1918 Remembrance Services were held all over the country. In Hedon a procession formed up outside the Town Hall led by Lieut. Stonehouse who was in command of the Hedon Platoon of the East Yorkshire Volunteer Regiment. They were followed by the local police led by Inspector Sweeny, and the Special Constables led by Mr. W.H. Todd as Group Leader. Next came the Sea Scouts under R.F. Jameson and the Hedon Nursing Division of St. John’s Ambulance Brigade led by Mrs. Jameson and land workers under Mrs. Watson. Also in the parade were brothers of the Oddfellows Lodge and burgesses of the Town. They proceeded to St. Augustine’s which was already well filled with people. The Rev. Ainslie preached on paying attention to spiritual matters as necessary to winning the war. The collection was split between the Lord Roberts Workshops Memorial Fund and the St. Dunstan’s Home for Blinded Soldiers. 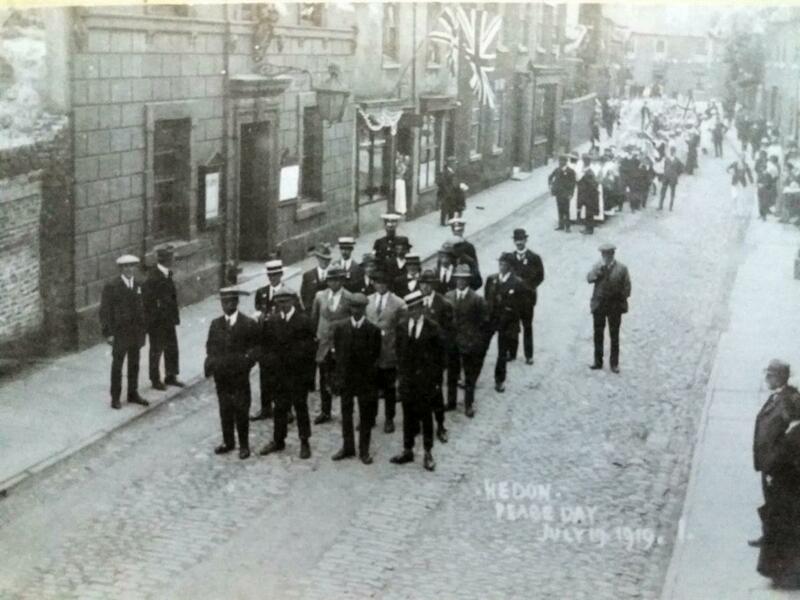 The Procession then marched to Market Hill where they were addressed by the Mayor R.A. Park. All sang the National Anthem and the procession then moved off back to the Town Hall. After the Armistice it took until July 1919 until the Peace Treaty was signed. Saturday 19th July 1919 was set as the date for the official celebrations. In Hedon the celebrations started the day before when all children under 16 were presented with a peace medal by the Mayoress Mrs. R.A. Park. That evening the men of the town assembled, many in costumes, with flaming torches to proceed to the Market Hill where a massive bonfire was built. The parade was led by Mr. Beet and the prizes for the best costumes went to Messrs. Sharp, Dean and Todd. Also in the parade was an effigy of the Kaiser. The torches surrounded the bonfire and the ‘Kaiser’ placed on top. Mrs. W. Heron lit the pyre and there was much cheering when the Kaiser caught fire. There were many coloured lights and fireworks too. 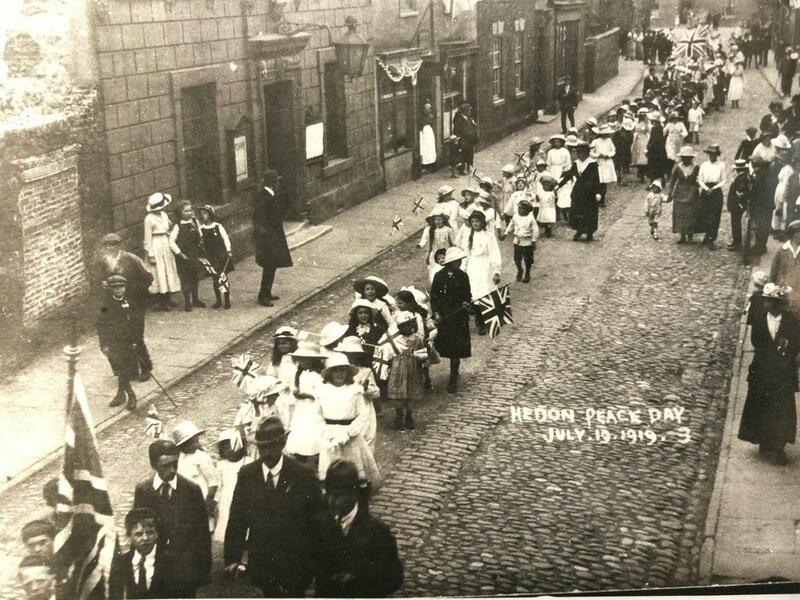 On the Saturday morning a procession formed on the cricket field and marched to the Town Hall. This procession was nowhere near as formal as that of the previous year. At the Town Hall the Mayor was preceeded by the Mace Bearer Howard Markham and ex-soldiers and their children, school children and nurses and others of the town. On Market Hill an open air service was held. The Vicar of St. Augustine’s said the prayers, the Wesleyan Minister read the lessons and the address was given by the Primitive Methodist Minister. Hymns and the National Anthem were sung with the church bells being rung at intervals led by Mr. Horseman. At 1230 sports were held on the cricket field. Races were held for children and adults and there was a public tea for under-16s, demobilised soldiers and their wives and other invited guests. In the evening a concert was held at Lambert House by kind permission of Col. And Mrs. White. The house and grounds were decked with flags large and small, and many fairy lights. There was much singing and dancing with the local school children performing too.